These details were taken from the Dec 1998 issue of The Family Historian, issued by The Gold Coast Family History Research Group Inc. It was written by Jemma Ussher. By common consent the most learned prelate that ever adorned the Irish Protestant Church, he was born in Dublin 4 Jan 1580. His father was Arland, a younger brother of Primate Henry Ussher, and his mother was Margaret, daughter of James Stanihurst, three times Speaker of the Irish House of Commons, a Master of Chancery and Recorder of Dublin. His father, Arland or Arnold, was one of the six clerks in Chancery. He praised much, two of his aunts, blind from their infancy, who had such wonderful memories, as to be able to repeat most of the Bible by heart, and who, he said, were the first to teach him English. These were probably Alice and Katherine Ussher, his father's sisters. He was at this time very fond of poetry, and also it is said of card playing, but when only twelve years old, on reading a book of History, and reflecting on a saying of Cicero's, "Nescire quid antea quam sis acciderit, id est, semper esse Puerum." i.e., "to be ignorant of what has happened before your birth, is to be always a child," he determined on the study of Antiquity and every kind of learning. In 1593, the building of Trinity college in Dublin being finished, then in his 13th year, James entered as a scholar. It was claimed that he was the first scholar entered on the roll, but from an old list it would appear he was the second scholar, and the 8th Fellow elected by merit. In 1598, being then a B.A., he intended to enter the ministry, but his father wished him to study Law, which he would have done, though unwillingly, but his father's death set him free. Though he was the heir, he transferred his inheritance to his younger brother, Ambrose, and his sisters, keeping only enough to buy some books and maintain himself in College. He then proceeded, after the solid fashion of the times, to read up the entire literature of the ecclesiastical antiquity - a task that occupied him from his twentieth to is thirty-eighth year! In 1601, he was ordained deacon and priest, and was shortly after appointed preacher at Christ Church, Dublin. Soon after, he visited England to purchase books and MSS for Trinity college library. His talents and the favour of his sovereign, James 1, successively procured him the professorship of divinity at Trinity college; in 1607 the office of chancellor of St Patrick's; the bishopric of Meath in 1620; the post of privy councilor in 1623; and the following year the primacy of all Ireland. He went on numerous visits to England, in the course of which he made the acquaintance of most of the distinguished scholars of the age. In 1613, his first publication appeared, entitled De Ecclesiarum Christianarum Successione et Statu, which was designed as a continuation of Bishop Jewel's Apology. "August 24, 1621. I received the leaves of this booke and found them to be in number 344. He who reckoned before me counted six score to the hundred. Ja. Ussher (Episcopus) Midensis Elect." The book of Kells was donated to Trinity College, with most of Ussher's library, after his death. 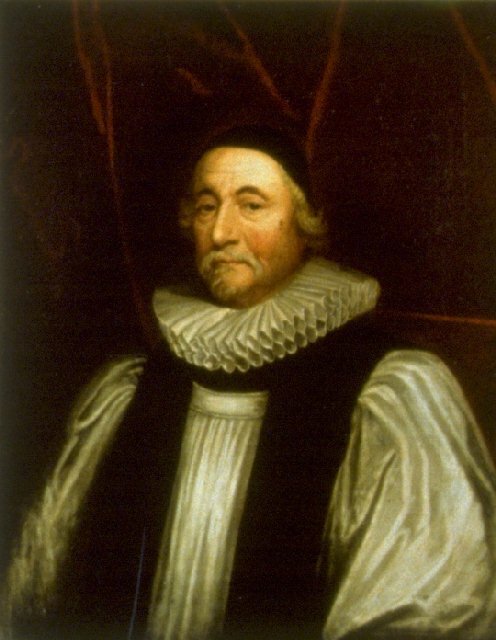 1n 1623 King James, hearing that Bishop Ussher was going to compile "The Antiquities of the British Churches" urged him to go on with it, and wrote to the Irish Council to grant him leave of absence in order to consult the MSS in the English Libraries. He accordingly went over to London in 1624, and preached on 20th June, before the King at Wanstead, a sermon on the Universality of the Christian Church, and the Unity of the Catholic Church, which the king ordered to be printed. In 1632, Ussher published a collection of letters concerning the state of the Irish Church from 592 to 1180; in 1638, Emmanuel, or a Treatise on the Incarnation of God; in 1639, Brittannicarum Ecclesiarum Antiquities, which is said to contain "a most exact account of the British Church, from the first planting of Christianity, twenty years after the crucifixion, down, both in Britain and Ireland, to the end of the seventh century." As he grew older he matured in wisdom and tolerance, losing his youthful prejudice against other religions and forms of worship. His name as a man of learning became known throughout Europe, and penetrated into the far East, where he had agents employed to secure valuable books and rare MSS at considerable expense. Among the latter were the Samaritan Pentateuch, and a Syriac version of the Old Testament. In the year 1641, while Ussher was in London with his wife and daughter, he endeavoured to prevent Charles I from sacrificing to public displeasure his minister Lord Stafford, whom Ussher attended in prison and at his execution. In the Irish rebellion, in October of that year, the rebels plundered his house and property, leaving nothing but his Library and some furniture in his house in Drogheda, which was long besieged by the rebels. This decided him to quit Ireland and in consequence he was offered a professorship at Leyden; and Cardinal Richlieu invited him to settle in France, promising him his patronage and total freedom as to the practice of religion. But he thought it proper to decline both proposals. He adhered to the King's interest during the civil war and wrote in his defense a treatise on "The Power of the Prince and the Obedience of the Subject". Witnessing the execution of Charles I, the scene had such an effect on him that he fainted; and he afterwards commemorated the event by an annual celebration of funeral rites and fasting, for the deceased monarch. In 1650 Oliver Cromwell sent for Dr Ussher, who went unwillingly, and was received with great outward kindness and civility. The conversation was chiefly about advancing the Protestant interest abroad and at home. On that occasion Cromwell promised him a lease for twenty-one years of some lands belonging to the See of Armagh which he accepted on behalf of his daughter and her children, but this was never granted during Ussher's lifetime, and after his death was refused to his daughter and son-in-law on the score of malignancy. In 1655 he paid a second visit to the Protector, in order to persuade him to allow liberty in private to the Episcopal clergy and succeeded in obtaining a promise that they should not be molested, but on a third occasion when he endeavoured to get this in writing, Cromwell said he had further considered the matter, and could not do so. Pronounced by Dr Johnson "the greatest luminary of the Irish Church", he died in his 76th year, on 21 March 1656, at Ryegate, Surrey. Cromwell, who had banned the Church of England requiem service during the period of the Commonwealth, forbade Ussher's son-in-law to bury the Primate's body anywhere else other than in the magnificence in Erasmus's Chapel in Westminster Abbey and ordered the requiem reinstated for Ussher's funeral only, which took place on 17 April 1656. The funeral, although it brought Cromwell great praise for his "liberality" only cost the government 200 pounds, however the Primate's family later received a bill for three times that amount! Ussher's only child, Elizabeth, married Sir Timothy Tyrell (son of Timothy Tyrell, of Oakley, Bucks) about 1614 and had nine children. (4) Gorton’s Biographical Dictionary, Vol 111. A collected edition of Ussher's works, in 16 vols, with a new biography, was published in Dublin in 1841, by Dr Elrington. "The Whole Works of the Most Rev. 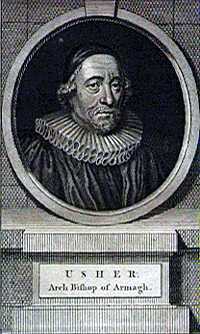 James Ussher, D.D. Lord Archbishop of Armagh, and Primate of all Ireland". This extends to some sixteen or seventeen volumes. Volumes XV and XVI consist of transcripts of letters to and from the Archbishop to various eminent people. They are mainly in English but some are in Latin and at times break into Greek. I understand that earlier volumes have a higher Latin or Greek content. "The Life and Times of James Ussher Archbishop of Armagh", by J.A. Carr, LL.D. Vicar of Whitechurch Dublin; Canon of Christchurch Cathedral. The book was published in London in 1895 by Wells Gardner, Darton and Co. of 3 Paternoster Buildings, E.C. and 44 Victoria Street, Westminster, S.W.